There was plenty of buzz about the Miami Dolphins' changes in the passing game as the Dolphins look to have a much better aerial attack than they did a year ago. At wide receiver, Miami added deep threat Mike Wallace and dependable Brandon Gibson. Davone Bess is no longer a part of the receiving corps and tight end Anthony Fasano is now a Kansas City Chief and will likely be replaced by former New York Jet Dustin Keller. Perhaps lost in all the mix however, is Miami's leading receiver from 2012 and the team's single-game receiving record holder, Brian Hartline. 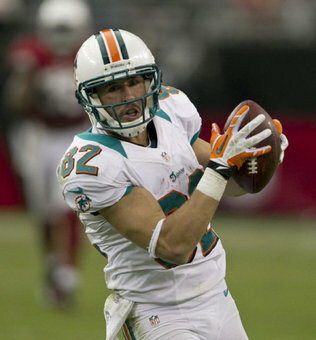 Hartline led the Dolphins in 2012 with 1,083 yards receiving on 74 receptions while scoring one touchdown. That lone touchdown came in Week 4 in Arizona on an 80-yard bomb from Ryan Tannehill in a game where Hartline tallied a franchise-record 253 yards receiving. Hartline not only led Miami in receiving in 2012, he had more receiving yards last season than anyone on the current roster, including Wallace. Hartline also averaged 14.6 yards-per-catch last season which was tops on the team for all players with more than six receptions. Hartline even recorded a higher percentage of first downs than Bess, a player known for being a good third down receiver. Hartline has a good rapport with second-year quarterback Tannehill and with the exception of Tannehill, no one will benefit more from the acquisition of Wallace than Hartline. With few deep threats on the outside last season, Hartline was the focus of most opponents' defensive schemes against the pass. With Wallace now on the roster, the focus will be taken away from Hartline which should allow him to excel for a second straight season. Hartline has also proven to be dependable, both with his health and with his hands. Hartline has missed just four games in four NFL seasons and has played in all 16 of Miami's games in each of the last two seasons. Hartline has great hands, having made a number of excellent catches in his career and once he gets the ball, he usually does a good job of tucking it away. Hartline fumbled just once last season and with 183 career receptions, has done so just twice in his career. With the additions of Wallace and Gibson, the Miami Dolphins should certainly be a better passing team in 2013, but as important as the new additions will be one of the more reliable players from a season ago, Brian Hartline. With much of the pressure taken off Hartline with the addition of Wallace, the Dolphins should have one of the better 1-2 punches at receiver in the AFC. It's also not beyond the realm of possibility that with more weapons and a more experienced Tannehill, that Hartline could actually have a more productive year for the Dolphins in 2013. Mike Ferguson is a staff writer at Dolphin Shout and the founder and editor of Outside the Redzone. Like Outside the Redzone on Facebook! Where Would the Dolphins Be without Free Agency?